Most of the Eastern Partnership countries being also the TRACECA member-states follow common objectives and tasks – the development of trade-economic relations and transport communications. 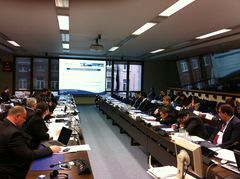 Within the framework of the Transport Panel Meeting of the Eastern Partnership held on 21 February 2012 a wide range of synergy issues and development prospects were proposed for discussion with the focus on 3 priority areas of cooperation: transport infrastructure, safety and security of all modes of transport, trade facilitation and logistic processes improvement in the TRACECA countries. Both investment projects and technical assistance projects realized and supported by the European Union in the TRACECA countries in priority transport areas directed towards the promotion of sustainable development of transport system along TRACECA corridor are principal components of cooperation. The upgrade of transport infrastructure of the TRACECA corridor is connected with the necessity of attraction and development of large sizes of financial resources and investments. With the view of ensuring more active information exchange and cooperation of TRACECA countries with potential investors under TRACECA with the assistance of the European Union Project “Transport Dialogue and Interoperability between the EU and its Neighbouring Countries and Central Asia” there is provided support in arranging the forthcoming TRACECA Investment Forum 2012. The considerable share of the EC technical assistance to TRACECA countries is aimed at reforming the legal and regulatory basis of the countries to adjust it in accordance with international and European standards. Mr. Eduard Biriucov, Secretary General of TRACECA noted that there is considerable potential for cooperation and significant perspective for mutually agreed and complimentary action in order to achieve common goals of the TRACECA Programme and the Eastern Partnership.